Do you want some alternatives to view your photos on Windows 10? Check this list of the best photo viewer for Windows 10. 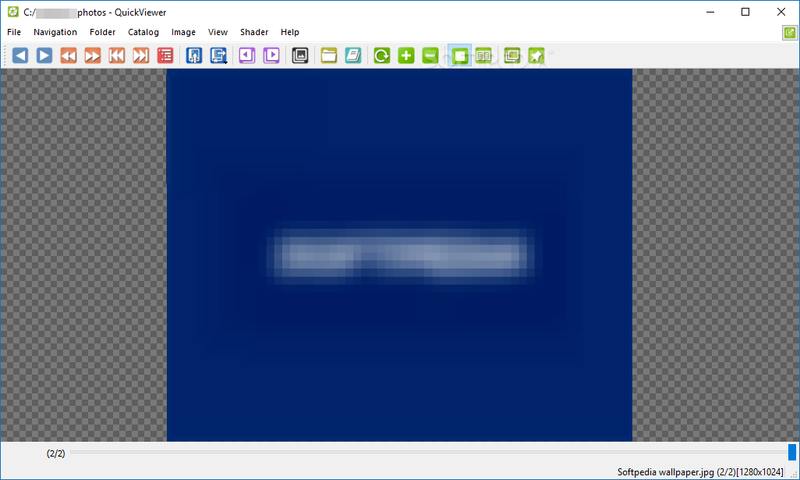 Traditionally, Windows Photo Viewer has been quite limited in functionalities, being one of the worst the full-screen display of specific content. Photos of Windows 10 improved that and also added easy photo editing options, along with the ability to navigate between folders. Despite this, this default program lack some features you will see on the best photo viewer for Windows 10. Using one or another program to view photos in Windows depends on what you look for in them. You may need a simple program to see pictures and be able to pass quickly between them to full screen, or maybe you need to look at them comfortably and go expanding details with simple clicks on the mouse or wheel movements. Therefore, I will describe each one of the best photo viewers for Windows 10. This is one of the oldest photo viewers for windows that you can find that are still in development. It is a direct and straightforward program, at the same time powerful and with limited consumption of resources. It even allows visualizing images of corrupt files (the parts that can be saved, at least) instead of showing the typical error when opening the images. As the only downside, to zoom, you have to use the Control, and when we zoomed in, you can move the image with the wheel from top to bottom or with the right click. It is not the most intuitive, and to open RAW photographs it is necessary to download a plugin, so if you need this without complicating your life, it is better than you choose another program like the ones below. This photo viewer for windows is one of the newest in the list. It allows you to view photos in full screen effortlessly and directly. Nomacs can display folders in tree and thumbnail viewer. The program is fast and allows you to edit basic settings such as brightness, contrast, saturation or exposure. Accepts images in RAW and PSD, allows to save specific frames of a GIF, and even has a portable version of 64 bits, as well as compatibility with macOS and Linux, in addition to Windows. As a simple visualizer for me, it is the best option. The animation in the image transition can be disabled in the settings by resetting the animation time. Also, it allows you to move from one photo to another while maintaining the zoom, ideal for comparing compression qualities. 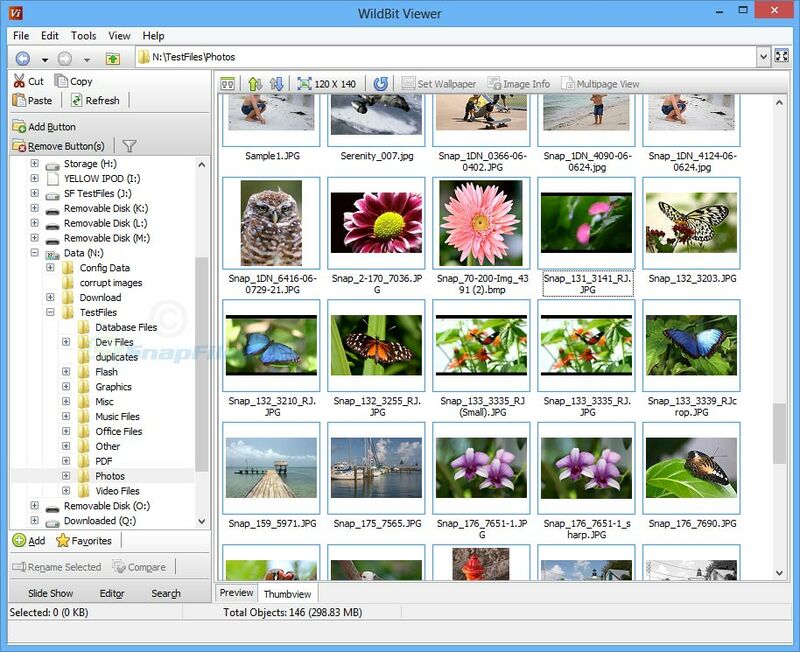 WildBit Viewer is a quick and complete photo viewer for Windows 10, which has a reasonably accurate zoom with the wheel incrementally, a photo editor with many tools, the possibility of including metadata to a whole group of photos. It also allows you to compare images side by side and has a full-screen display mode that will enable you to be operated and controlled from an Android mobile with WiFi thanks to its remote control app. XnView is probably the best photo viewer for Windows 10 because it can open almost all files. Through plugins, it is capable of being compatible with more than 500 types of data, and even converting them to 70 different formats. It’s fast and has a file browser to view photos in miniature, and allows some necessary tweaks like brightness, rotate, crop, resize, or apply effects, even to several images at once. XnView is very customizable and is available in more than 45 languages. Also, the user can choose between three types of photo viewing according to their needs. The three options (Minimal, Standard, and Extended) include different functions and plugins. 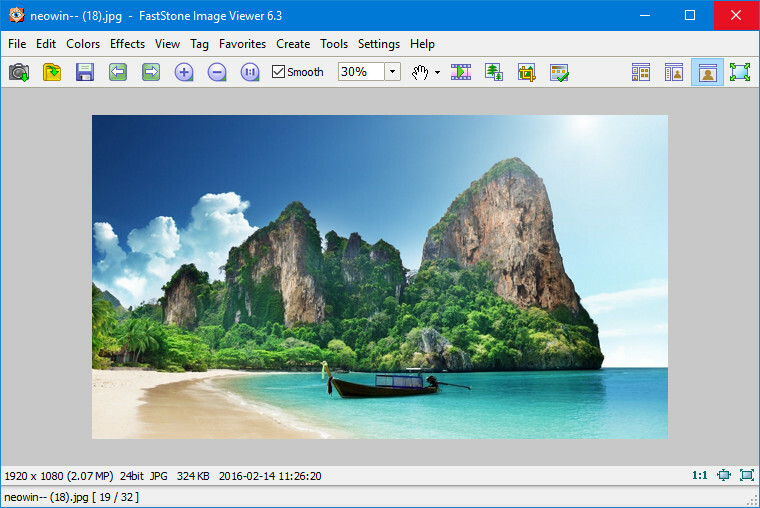 FastStone Image View is my default photo viewer for Windows 10. It has the most intuitive interface of all the programs of the collection and has a full-screen mode that other programs don’t have since it has several panels that are shown when you move the mouse to each of the edges of the screen. In the right, it shows us the metadata of the photo, in the upper part you can see other images of the folder, in the left, you can make photo retouchings like brightness, color, and even improvement of detail and function of cloning as in Photoshop. The zoom works very directly. When you click left, the image is enlarged to the percentage that you have chosen by default. 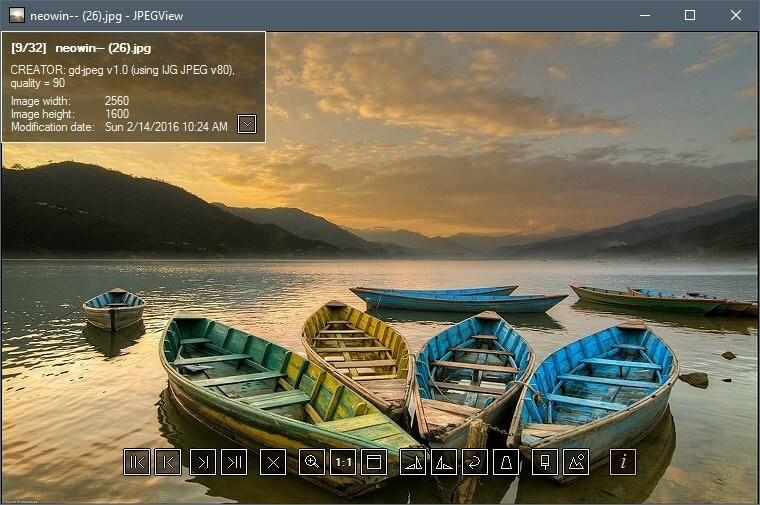 The program supports RAW photo viewing and allows you to send photos to other programs that you select by right-clicking (for example, Photoshop). 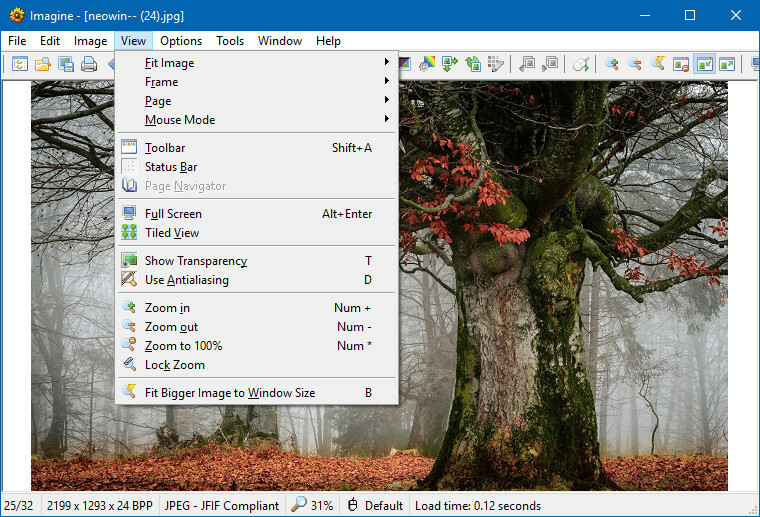 When double-clicking in full-screen mode, the image is minimized, and you can see the folders display in tree and thumbnail viewer. It is the fastest of all the collection programs. Quite less known than the other options, but Imagine is a hybrid with which you can make simple visualizations IrfanView style or basic management of folders like FastStone. And all in such an incredibly light photo viewer exclusively for Windows that its installation file, even 64-bit, weighs less than 1 MB. 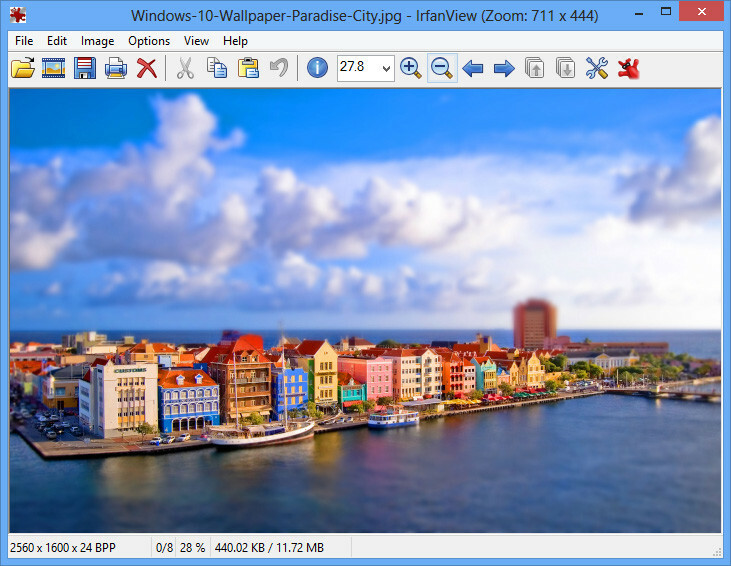 QuickViewer is the best portable photo viewer for Windows 10 that is available for 32 and 64-bit architectures. Regarding the versions, its developers recommend using at least Windows 7. As it is a program that doesn’t require installation, the user will only have to extract the downloaded file and look for the executable to start the image viewer. Taking into account that you have started from the default solution in Windows operating systems, it must be said that it has all the functions. But QuickViewer loosely improves both the operation with the number of existing features. Although its operation is mainly focused on images, you will see that this is not the case. As far as compatible extensions are concerned, it allows viewing: bmp, png, jpeg, dds, webp, ico, tga, tiff, and gif. That’s it? No, it also enables visualizing zip, 7z, rar, cbr, and cbz. In regards to RAW formats, it is also compatible with crw, cr2, nef, arw, and dng. This is photo viewer for Windows 10 with an extensive list of compatible files. There are three options when opening images with this photo viewer. The first one is by double-clicking on the file in question, although it is true that previously it is necessary to configure so that the files with this extension use the program in question by default. The second way is after running the software, using the shortcut. And finally, selecting files that contain images inside. Regarding the resolution, users can enjoy files of up to 4608×3456, not offering any delay when loading content. This is an aspect that isn’t achieved with all the visualizers, providing a small delay when making transitions between elements. The user has in the upper part of the window a menu that offers buttons to perform different operations. In some cases, you can use both the keyboard and the mouse to perform these actions directly. Finally, if what you are looking for is minimalism, then another photo viewer for Windows 10 that you should not stop trying is JPEGView. 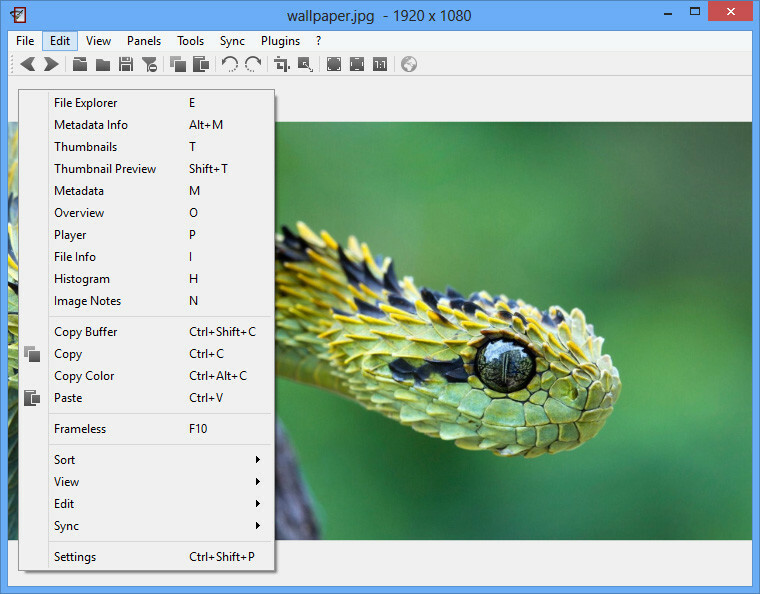 This photo viewer is characterized by being compatible with the main image formats of today (including Webp), in addition to showing the user a reduced entirely interface but, from its contextual menu, it allows us to make all kinds of modifications and to retouch in the images. So far those were the best photo viewer for Windows 10 that you can download for free. 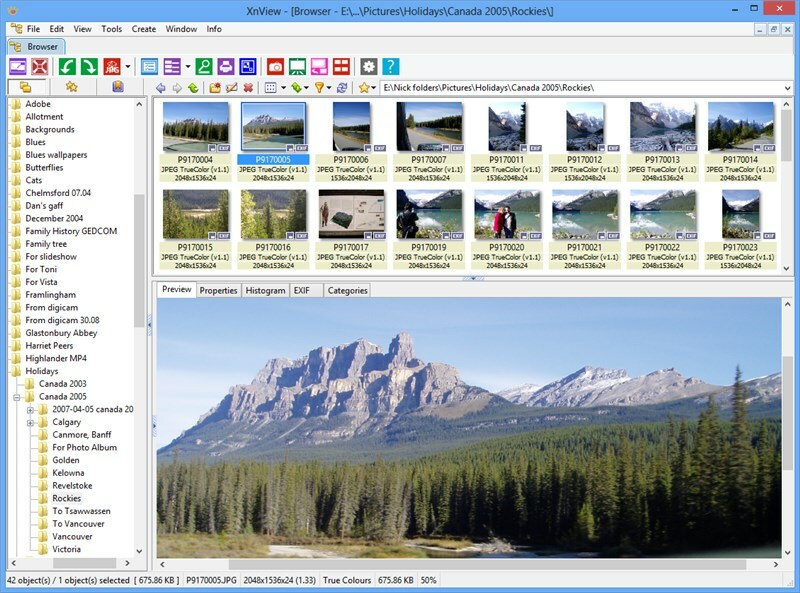 Do you use another photo viewer on your PC? Let me know in the comment section to add it to the list.